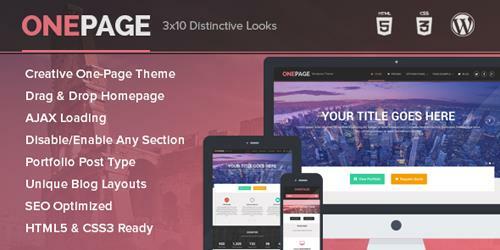 Onepage is a must-have single page WordPress theme. Featuring a creative Drag and Drop homepage layout and unique blog layouts, OnePage has a responsive design with clean, handcrafted code that loads fast and is optimized for SEO. Fully customizable, it includes powerful theme options and features to help your site.